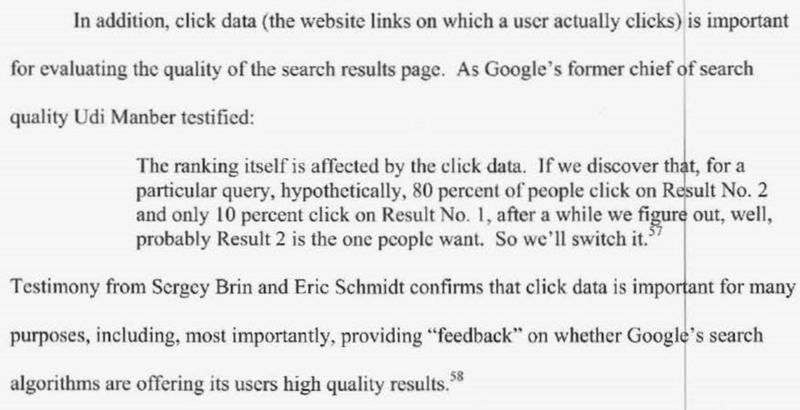 It is interesting that Google still refuses to confirm if clicks are used as a ranking signal. They may switch a #1 and #2 search result but will they be willing to move a website from the third page to the first page if it has a very high CTR? From personal experience I can tell you that as the click through rate (CTR) increases the search ranking almost always increases. I have several case studies on specific resources and blog posts that had a click through rate of about 15% while ranked on the bottom of the front page of Google search. Over time, the average ranking position increased which, in turn, caused the click through rate to increase. If you notice you are ranked #1, #2 or #3 and you have a very low CTR there is a good chance you will see your search rankings drop in the near future. Unfortunately, there is very little you can do to change the CTR other than optimize the title and the description that shows up in Google search. If this is something you need help with please feel free to reach out to me at jwojdylo@gmail.com. I have several packages that can help you rank higher in the Google search results. At least once a week I go into Google Webmaster Tools and look at the click through rate of the keywords I rank for. My website is properly optimized and most of my most trafficked keyword phrases have a CTR well above 25%. As my CTR continues to remain high I am getting more search traffic and higher search rankings. If you want to generate business through search traffic I would strongly urge you to check out the CTR for the keyword phrases that are generate traffic to your website. If you can increase the CTR of these phrases to double digits you will see your search rankings increase. Do you think Google ranks search results based on the CTR? Do you think you can jump in the rankings quickly if you get natural more clicks to your website?